The release of my new cookbook, How To Make Frozen Yogurt, is just a few days after St Patrick’s Day this year, so I decided to celebrate the holiday by doing something a little different than making a batch of corned beef and cabbage. I made frozen yogurt instead, and with an Irish twist.Â I’ve had Guinness ice creams before, but I’ve never had anything quite like this Chocolate Guinness Frozen Yogurt. The flavor is inspired by chocolate stout cakes, where stout beer, like Guinness, is added to a chocolate cake to intensify its chocolate flavor. Guinness stout has a very distinctive flavor with notes of coffee and malt – both flavors that go very well with chocolate. I reduced the Guinness by nearly 75% to intensify its flavor and to make sure that it wouldn’t water down my frozen yogurt base with too much liquid. The reduced beer doesn’t have any carbonation left and all the alcohol in it will have cooked off by the time you’re ready to use it. It has a slightly syrupy consistency and it does not taste all that great on its own because, like most other beer, stout has a distinct bitter note that is intensified when reduced. But don’t be put off by the reduction alone! That bitter note blends in with the natural bitterness of unsweetened cocoa powder, which is also in the frozen yogurt, and you end up with a dessert that has a rich, complex bittersweet chocolate flavor to it. It’s very chocolaty but also fairly sophisticated, and I can just about guarantee that you’re not going to find a flavor like this one – or as delicious as this one – down at the corner fro-yo store. 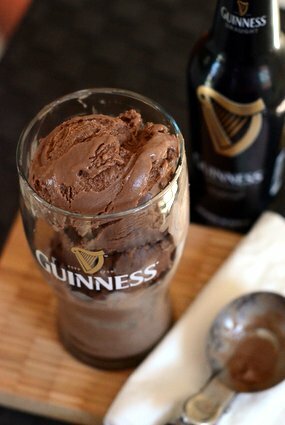 I serve this as-is, but if you’re a Guinness fan you can actually turn it into a beer float by pouring chilled Guinness over a few scoops of ice cream in a large mug. You can also up the chocolate factor by topping it off with some hot fudge sauce and chocolate shavings. Pour the Guinness into a medium saucepan. Bring to a boil (beer may foam up), then lower heat to medium and simmer until beer is reduced by three quarters, from 12-oz down to 3-oz, about 10 minutes. Pour beer syrup into a small bowl and combine with cocoa powder, whisk to combine. Set aside to cool slightly. In a small saucepan, combine water and sugar. Bring to a boil over medium-high heat. When sugar comes to a full boil, continue to boil for about 1 1/2 minutes. While the sugar boils, beat egg whites to soft peaks in a large, clean bowl. 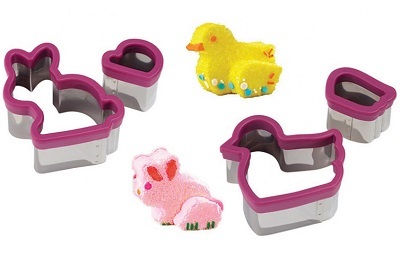 When the sugar is ready, continue beating the eggs at a low speed and very slowly stream in the hot sugar. When all the sugar has been incorporated, turn up mixer to high and beat until meringue is glossy and has cooled down to almost room temperature. In a large bowl, whisk together beer and chocolate mixture, yogurt and vanilla extract. Fold in the meringue until it has been completely incorporated. 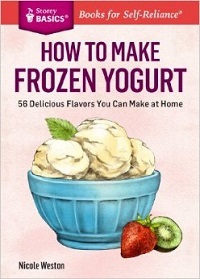 Pour yogurt mixture into ice cream maker and freeze according to manufacturer directions. This sounds wonderful! 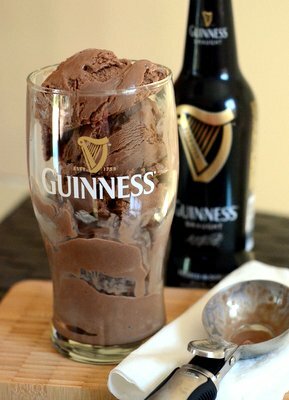 I love using Greek-style yogurt when making frozen yogurts and coupling it with Guinness just makes it that much better. I’ll have to try this with a gluten free dark ale. Sound interesting. This is amazing! I want it right now! Congrats on your new cookbook! I’m a huge fan of frozen yogurt made with greek yogurt and this looks delicious.